I typically try to avoid using products whose main goal is to “mimick” meat. While I think these products are great every once in a while as a treat, I don’t believe they should be a staple in a person’s diet. For some reason I’ve always put tempeh in this category of processed mock meat products, mostly because I saw it on so many menus as bacon, or meatballs or deli slices. I never really stopped to think about what tempeh was, all I knew was that it was normally lathered in oil, deep fried, or heavily salted to mimic bacon or other meat products. I recently looked into it because I heard it was such an incredible source of protein for vegan pregnancies. After reading the ingredients (whole soy beans, with a bacteria culture) I realized that it was actually less processed than tofu, which I am a huge fan of. Surprised, I bought some, tasted it and thought it would work out wonderfully crumbled into a heart chili. 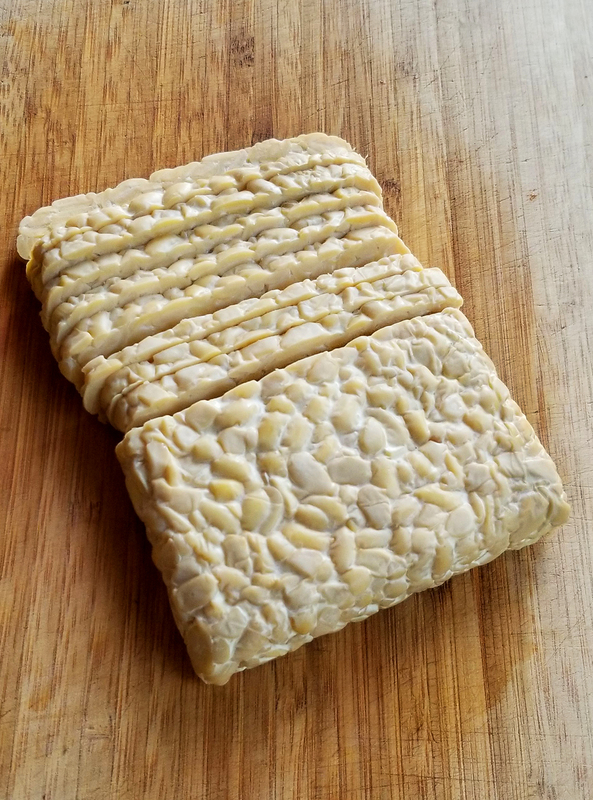 Because the soy beans are fermented, the tempeh has a very umami flavoring while also being mild and having a great bite. This combination makes it a great vehicle for absorbing other flavors, while also retaining a meat-like chew. 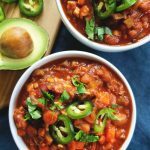 Adding the chopped tempeh along with sauteed mushrooms gives this chili a great body, typically found in traditional meat chilis. 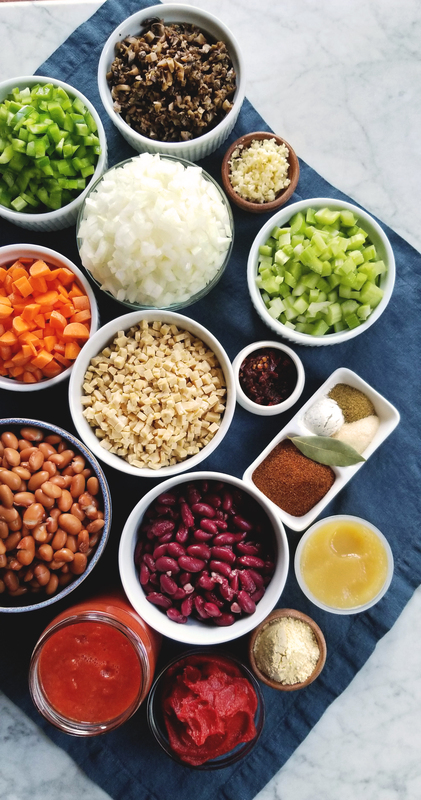 Simmered with aromatic vegetables like onions, garlic, and peppers along with pungent dry spices, and finished with bright tomatoes makes this chili well rounded and perfect for any eater! 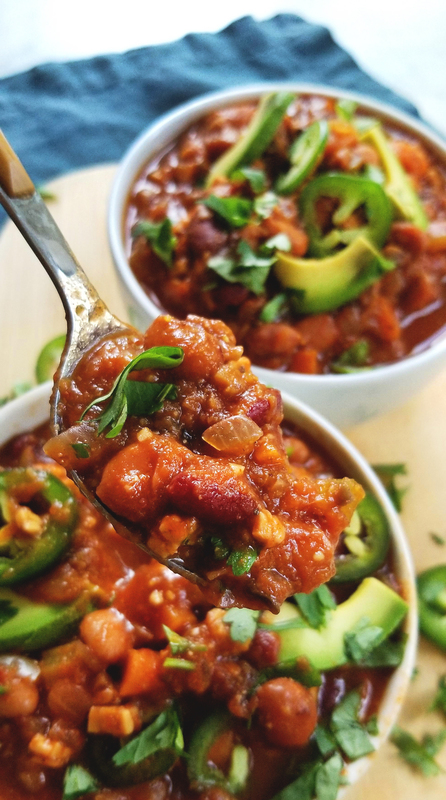 This is a great go-to chili that is low fat and LOADED with PROTEIN. It freezes well, which makes it great for meal planning, or prepping for a large party ahead of time. It is good on its own, but would also be wonderful poured over baked potatoes, brown rice, served with a big green salad, or used as a dip for tortilla chips! Make this cozy and filling chili for your next family dinner, or game day spread. Enjoy! 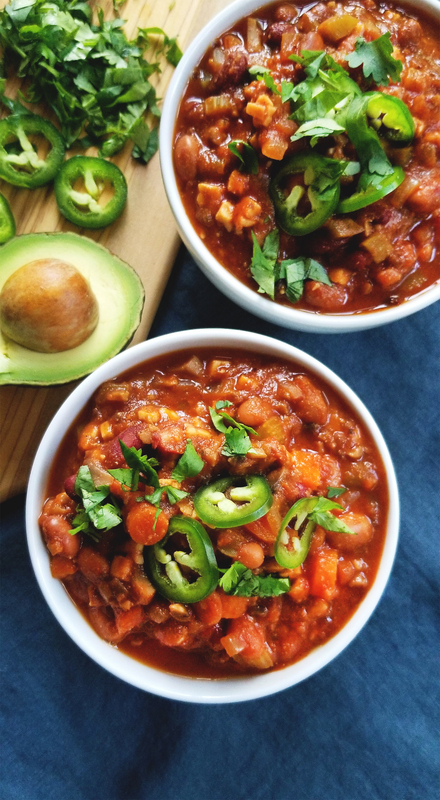 A hearty 1-pot chili packed with plant protein and oil-free! 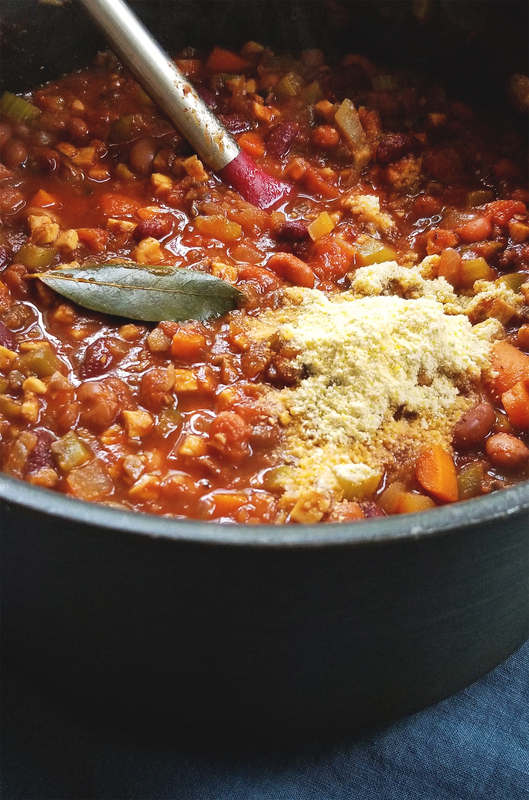 Spicy, smoky, and filled with flavor this chili is great with a big green salad, chips, or fresh cornbread. 1 package applesauce about 1/2 c.
If you do not already have sauteed mushrooms, take 2-3 cups of sliced white or brown mushrooms and in a large pan over medium high heat saute the mushrooms until they have browned and shrunk in size. You do not need to add oil, just make sure to mix the mushrooms around in the hot pan when they are squeaky(about 2-3 minutes) and wait for them to reduce. Set aside. In a large sauce pot over medium high heat, place the chopped onions with a splash of water or vegetable stock. Saute the onions until they begin to look translucent (about 2-3 minutes) then add in the garlic, carrots, celery, and bell peppers. Saute the veggies for 3-4 minutes until they begin to soften. 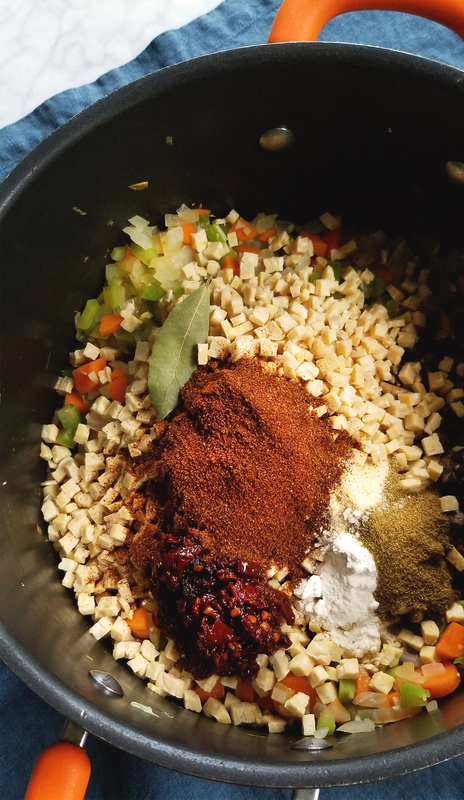 Season the veggies with a pinch of salt, then add in the mushrooms, tempeh, chipotle in adobo, bay leaf, chili powder, cumin, onion powder, and garlic powder. Stir to coat the veggies and tempeh and cook for another minute. Add in the tomato paste and tomato sauce and cook for another minute until incorporated. Add in the beans and veggie broth (or water) and bring to a boil, then reduce to a simmer. Mix well and cover. Let simmer on low heat for 15 minutes. Take the chili off of the heat, stir in the applesauce and the masa flour and let sit for another 5 minutes, letting the chili thicken slightly. Taste the chili and adjust the seasoning with more salt and black pepper. Serve with tortilla chips, cornbread, fresh lime, cilantro, jalapenos, or diced avocado! If the chili is too spicy you can add more applesauce, this will cut the spice and add a nice sweetness.